Some time ago, I was asked to explain in more detail about the RRS standard alpha rocket. Although it has been frequently referenced, some of our general audience may not be familiar with the many aspects of the alpha. Therefore, I have decided to devote an entire article to this subject. 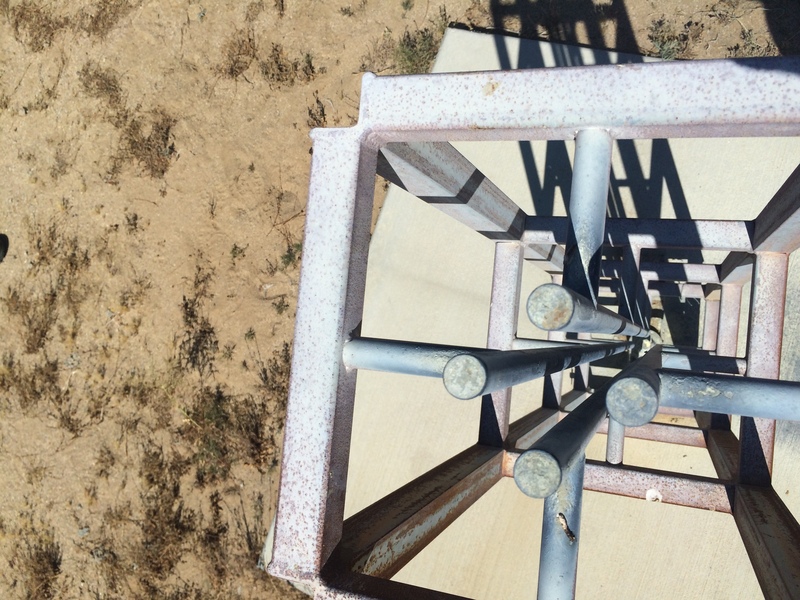 This standard design at the RRS has been a common beginner’s rocket in our amateur rocketry society. We use it in our build events with schools, offer it as an experimental testbed for universities and also for our members to conduct their own experiments. 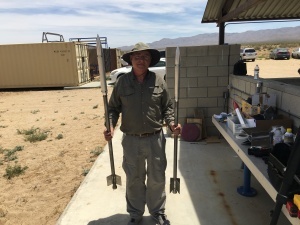 It has a long history with the RRS and we still continue the tradition of building these rockets as it is a nice platform for experimentation and introducing newcomers to amateur rocketry. A similar “Ft. Sill alpha” rocket design was mentioned in the 1960 book, Rocket Manual for Amateurs, by Bertrand Brinley. 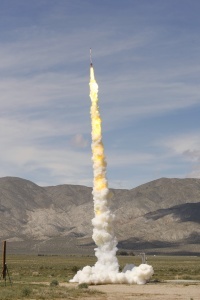 Over the years, there have been changes made to the alpha design, but this article describes what has become the RRS standard in the alpha rocket design. I have been told that the 1-inch alpha design was created as a smaller and cheaper-to-fly design from the 2-inch beta design. The alpha is a single-stage rocket consisting of a 3-foot length of 1.25″ outer diameter (OD) drawn-over-mandrel (DOM) steel tubing to hold the propellant. It is often erroneously referred to as a 1-inch rocket, which is more of a relative size measurement. 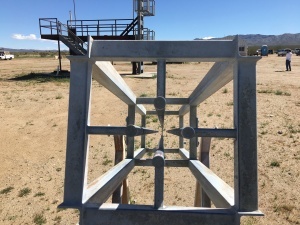 The propellant tube has four trapezoidal sheet steel fins welded at their edges near the bottom such that the rocket fits with the launcher rail design at the Mojave Test Area (MTA). 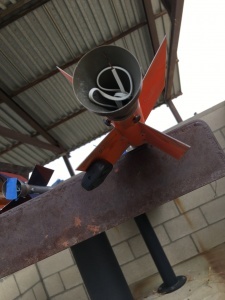 Once ready, the alpha rockets are top-loaded into the rails and the pyrotechnic operator (pyro-op) in charge hooks up the igniter wires once we go into a launch mode. 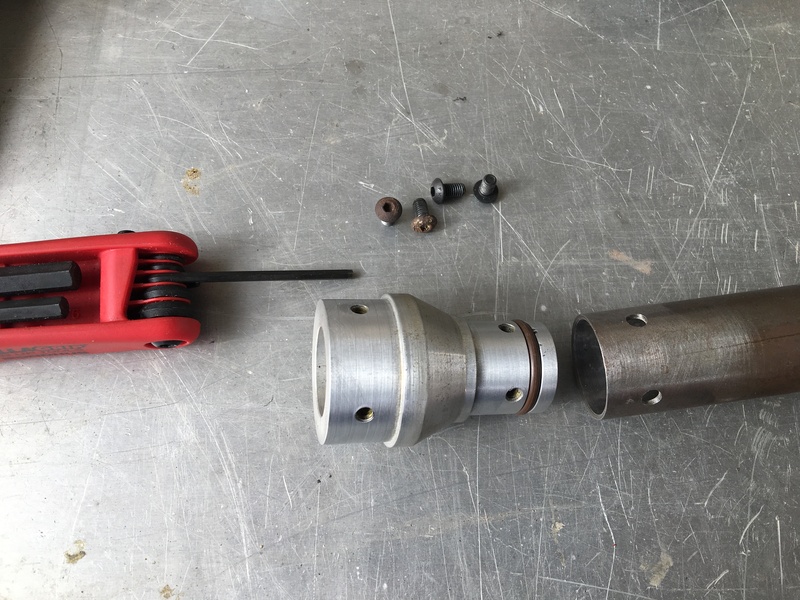 The propellant tube has a bolted bulkhead at the forward end sealed with an O-ring. 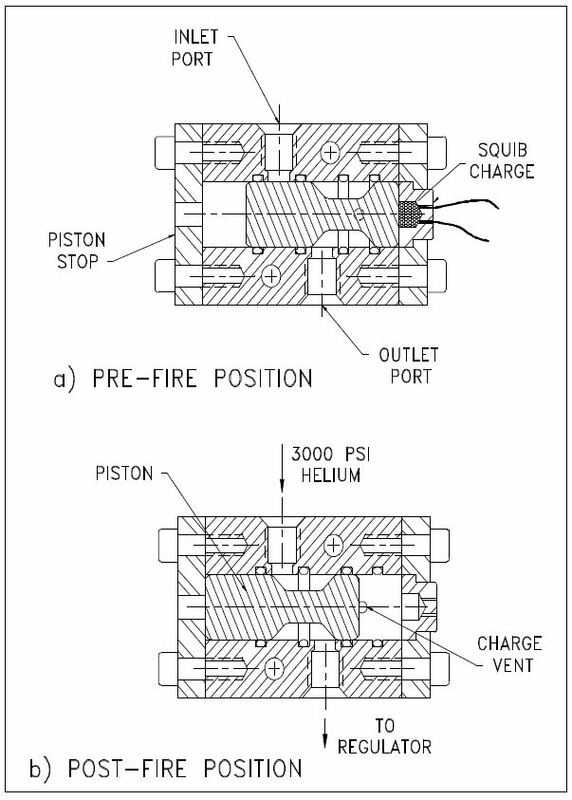 With good tolerancing, we’ve had no leakage from this joint and the four 1/4″ fasteners have sufficient retention under the brief ~1000 psi chamber pressure surge during combustion. 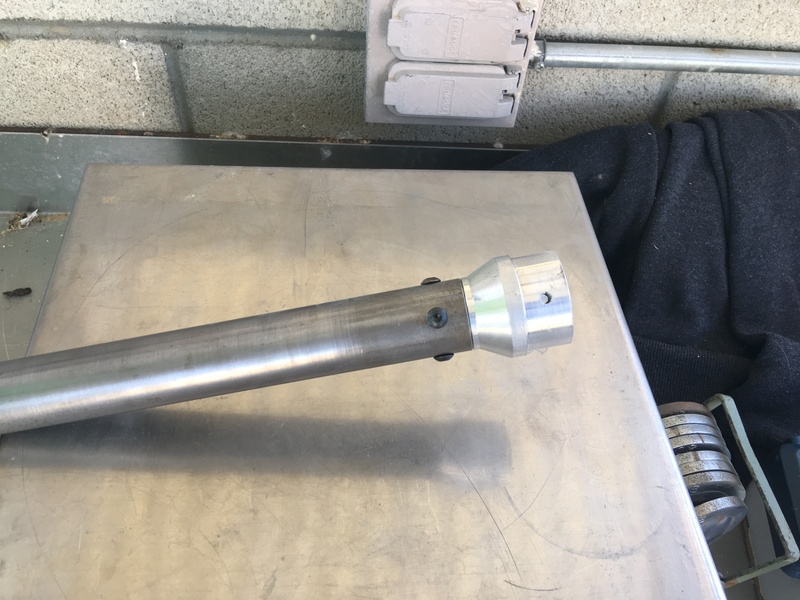 This solid aluminum 6061-T6 bulkhead is installed first into the top of the propellant tube to begin loading the powdered propellant from the aft end. 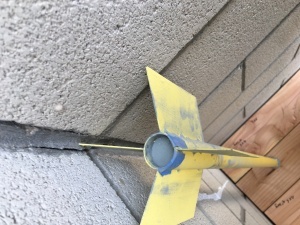 The powdered propellant is loaded using a metal funnel a little at a time and gently and periodically bouncing the tube against a wood block to help settle out any air gaps. Many different improvements to increasing the packing density have been tried by the society over the years, but the society uses no special method for increasing the packing density of the micrograin propellant in most of our launches today. Next the nozzle is loaded with a thin plastic burst disk (or diaphragm) with two tiny through holes to thread in an electric match (e-match). An e-match is a common pyrotechnic device used to initiate larger reactions with propellants. 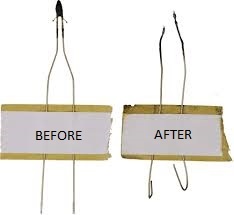 An e-match is two thin-gauge wires with a segment of nichrome heating wire bridging them. 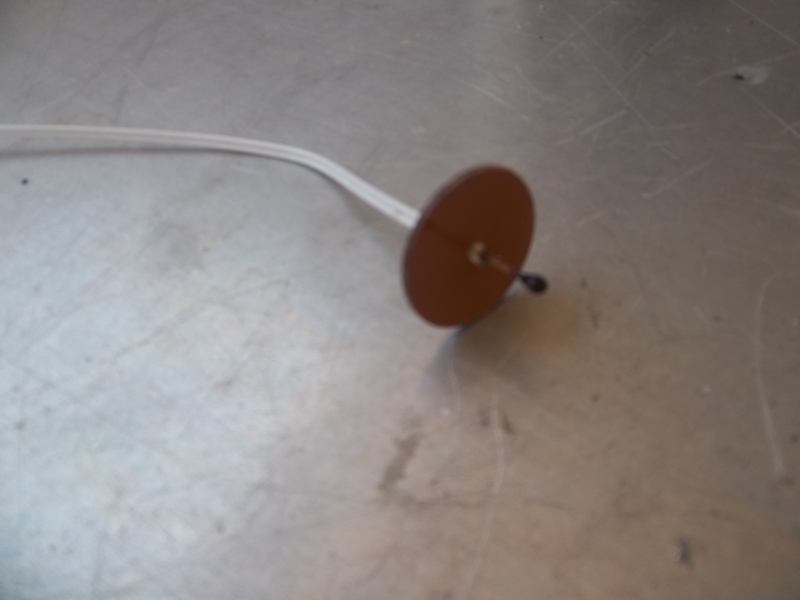 Covering the nichrome wire is a small amount of pyrogel compound that creates a brief high temperature flame once the match is given sufficient current. The e-match is single-use as the tiny wire is destroyed after ignition. 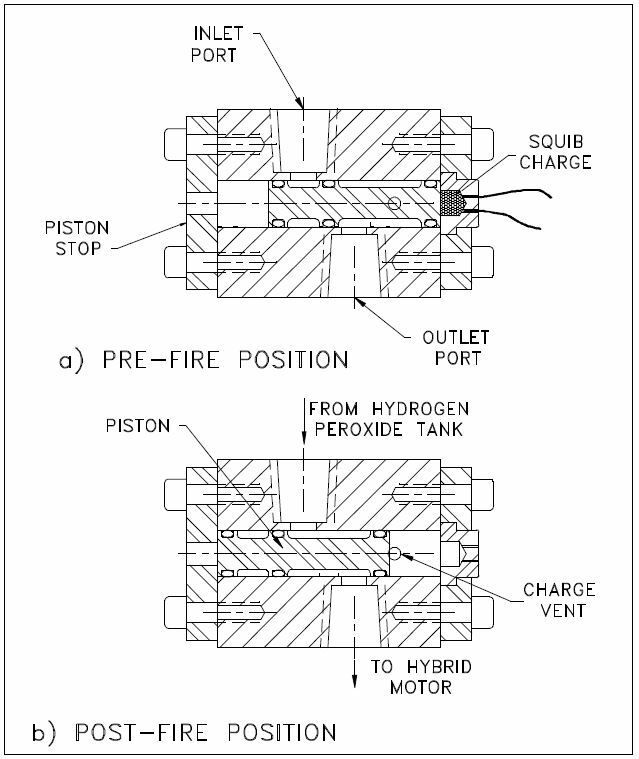 With the burst disk sitting on top of the nozzle facing inward to the propellant, the e-match is packed into the propellant with the thin wire leads running to the outside. The burst disk sits inside the propellant tube held behind the nozzle closing off the propellant powder in the rocket. 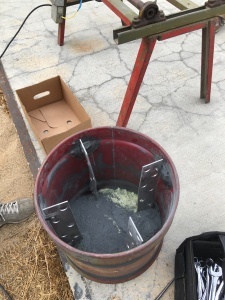 Although the zinc/sulfur micrograin propellant is fairly insensitive and stable, the e-match has sufficient energy to ignite the micrograin propellant behind the burst disk. 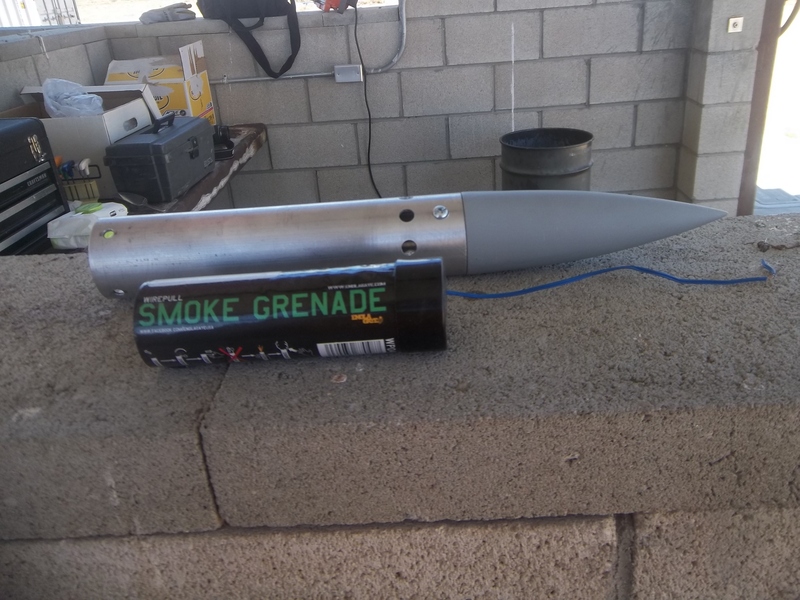 The use of a linen-filled Micarta burst disk is not only for practical reasons of holding the propellant inside the tube after the tube is turned right-side up, but it helps build up the chamber pressure after the first few moments after ignition. 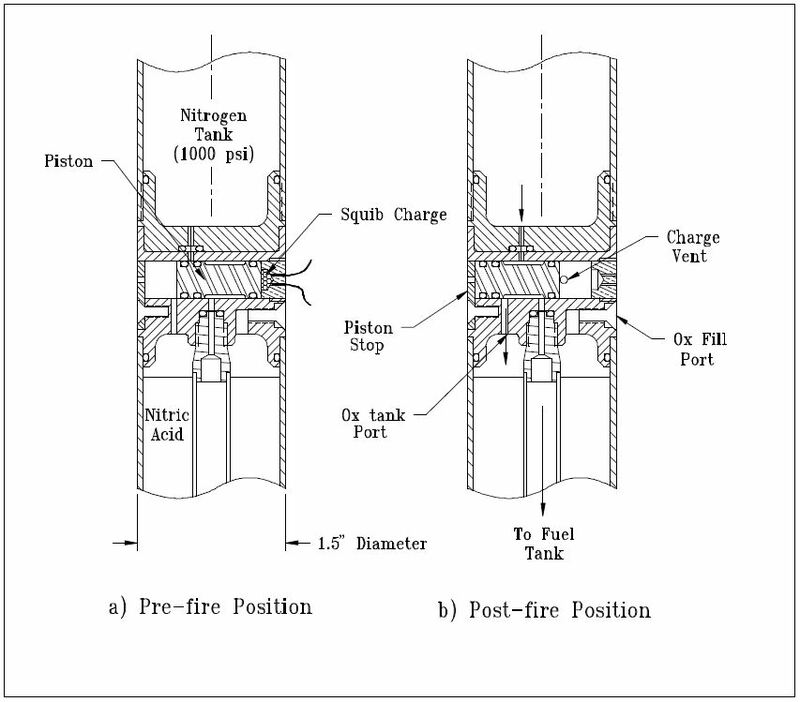 The burst disk is designed to sacrificially break under the elevated pressure created from initial ignition from the e-match. The thickness of the burst disk is carefully chosen to not over-constrain the initial pressure rise in the propellant tube on ignition. 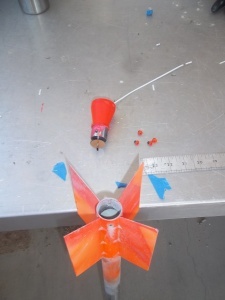 The burst disk fragments then quickly exit the nozzle as the rocket takes off leaving the lead wires behind. 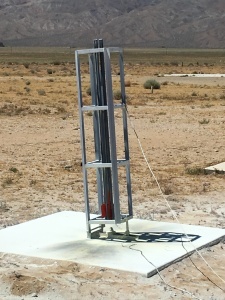 Above the coupler is the payload tube. 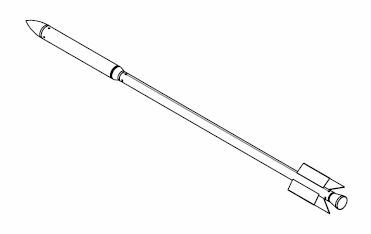 The standard alpha design uses a 1.75″ OD, 0.065″ wall, aluminum 6061-T6 tubing. 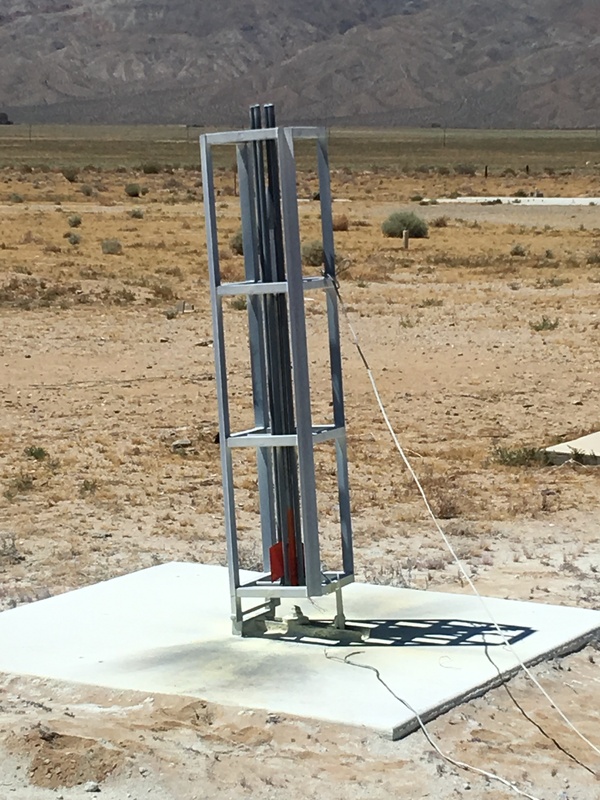 The standard design calls for an 18-inch payload tube length, but shorter versions have been flown with 12-inch lengths being common in some of our school launches. Nose cones have been made from wood, Delrin plastic and from solid aluminum. The RRS standard alpha design uses a tangent ogive shape which has been more of a traditional choice. Nose cones sometimes have hollow space inside for more payload capacity, although solid nose cones have also been used. 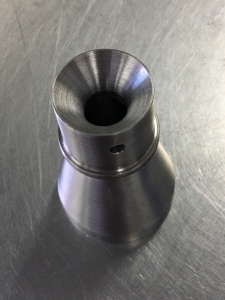 The aluminum nose cones are fairly light and are very damage resistant compared to the plastic nose cones that mash from impact or the wooden ones that shatter. Aluminum nose cones have been re-used in subsequent builds after some turning and polishing. 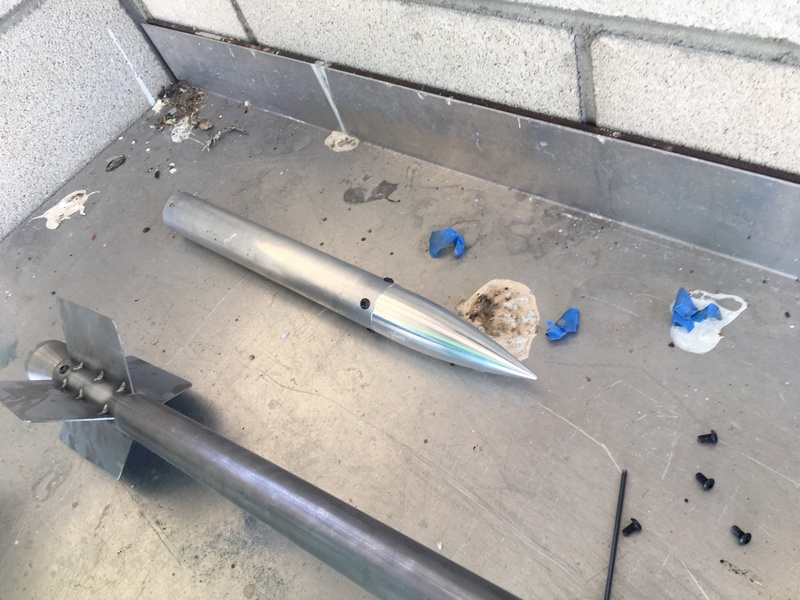 Instruments are flown in the payload section and although space is very limited in these small rockets, smaller chips have increased the number of measurements possible (altimeters, cameras, barometric pressure sensors…). Smoke tracers have been used in recent events with increasing success. 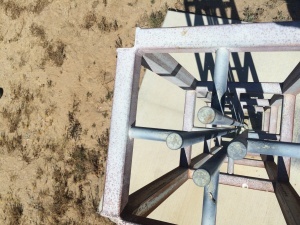 This helps in spotting the direction of flight and where to start looking to recover the rockets after impact. In these flights, we have a second set of ignition wires running to the rocket to first light the smoker before lighting the motor. 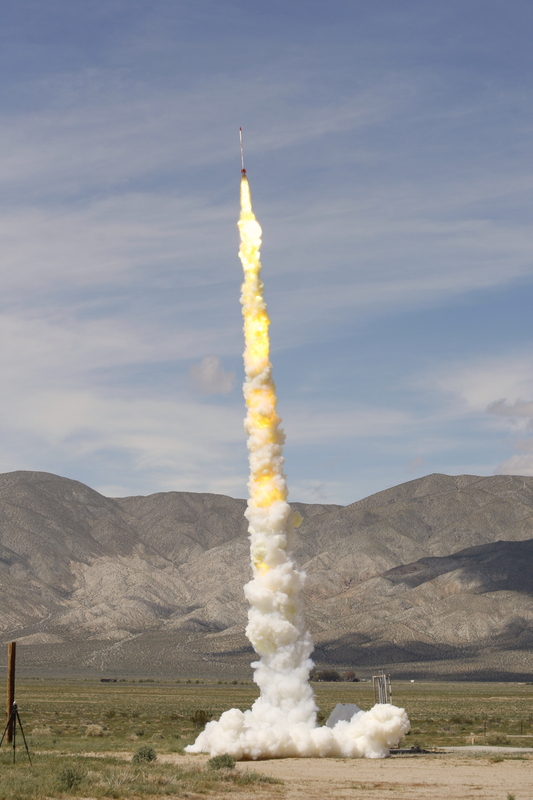 The alpha is a solid fueled rocket by what is called a micrograin propellant. The zinc and sulfur fine powders are one of the earliest solid propellants used in amateur rocketry and was invented by RRS founder, George James. 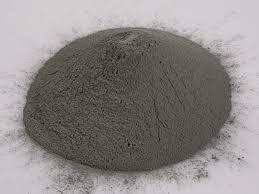 The RRS standard mixture is 80% zinc and 20% sulfur by weight. Different ratios have been tried in the society, but this is our standard. 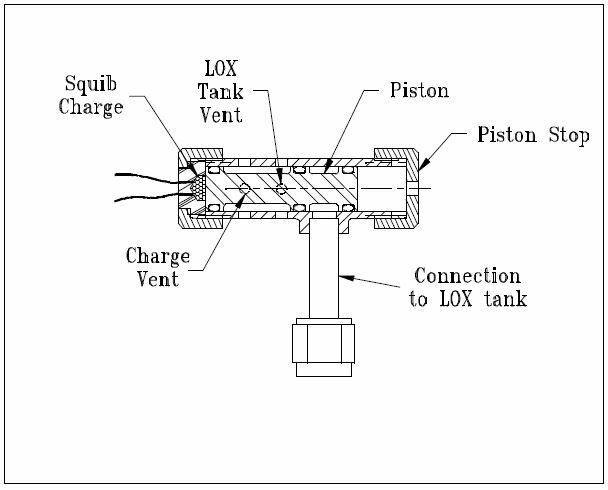 Although a low performer among today’s solid propellants, it is inexpensive, simple to find, comparatively stable and quite fast once ignited. The zinc and sulfur powder constituents are separately measured and weighed then added to the 30-pound capacity metallic mixing drum. 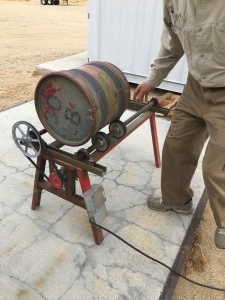 The mixing drum has internal metal baffles to speed up mixing as it is rotated on an electric motor driven rolling carriage. The empty weight of the alpha is 3.65 pounds. Measured after propellant loading, the alpha fully loaded is 6.55 pounds. 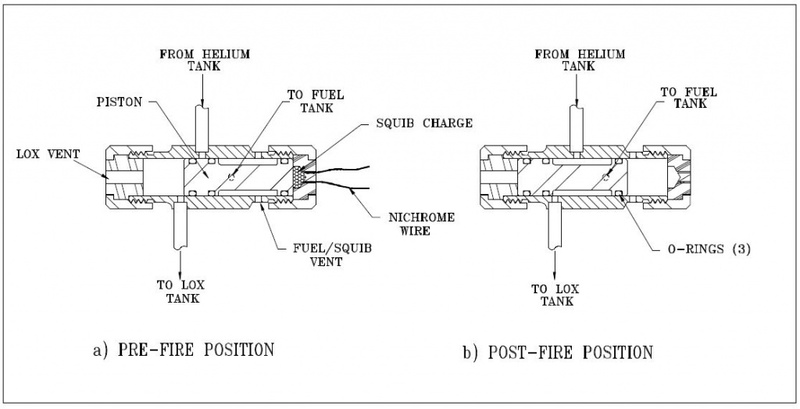 The calculated propellant load would be 2.90 pounds. 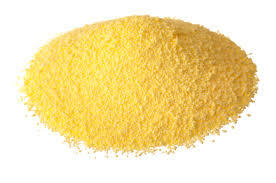 Specific impulse of the zinc/sulfur micrograin is quite low, 32.6 seconds. With an ideal combustion temperature of 2,600 degrees Fahrenheit, despite best efforts in packing, a significant part of the powdered propellant falls unburned out of the nozzle from the rapid acceleration even as the propellant is combusting. 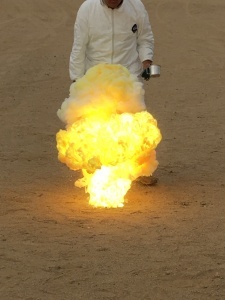 The rocket is supposed to operate as an end-burner with a 90 inch per second burn rate measured in many tests. Although most rocket groups no longer use the micrograin, the RRS maintains the tradition and it is hard to beat for simplicity. The burnout time is about 0.8 seconds and burnout velocity is subsonic (roughly 600 ft/sec). Apogee for the alphas have been estimated at 5,500 feet based on the flight times (35 to 38 seconds) from launch to impact. Despite the long history of launching the alpha, some of these performance figures haven’t had many recorded measurements. 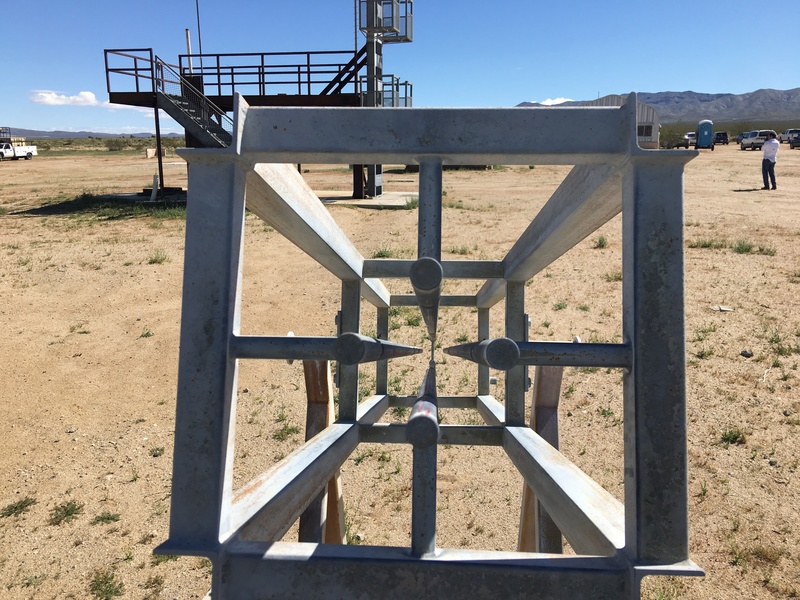 The RRS is working on making systems to take better measurements, not only for the alpha, but for any of the rockets we build and test at the MTA. If there are any questions about anything in this article or there is anything more you’d like to know about the RRS standard alpha, feel free to post a comment on our forum.